Jacob's Well is in Trinity Lane, on the north-eastern side of the church yard of Holy Trinity Church, this being formed from the nave of the priory church of Holy Trinity that was dissolved in 1538. Jacob's Well is a Grade 1 listed, 15th century timber-framed building with a puzzling history. It seems to have been erected as the Chantry House of the priory priest, (or quickly became so after it was built as two tenements). It is also said to be the house to which the last prioress of St. Clement's Nunnery retired when it had been dissolved in 1536. In the 18th century, the property became a public house and an extra brick storey was added. It is presumed that it was at this time that Jacob's Well took its current name, from the Old Testament story that tells how Jacob met Rachel at a well for watering flocks of sheep and fell in love with her. The tavern is listed in Baines Directory of 1823. It became unlicensed in 1904 - 1905 when bought by the rector of the church. When the extra storey was added, the original oak frame initially proved sturdy enough to stand up to the weight of the many tons of extra bricks. However, the stress seems to have taken its toll - the upper storey gradually leaned out over the lane and the floor of first storey bowed at the centre and sagged at the sides. As a result, a costly extensive restoration programme was conducted in the late 1980s . 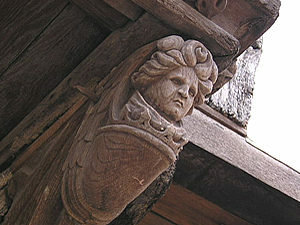 The upper Georgian storey was removed and a new 'crown and post' roof constructed, closely following the original 15th century design (reconstructed by examination of remaining peg holes and slots in the timber frame). Of particular note is the restoration of the plaster and timber front facade, including replacement of the bracket angels (unique in York) on the beautiful front porch . This had come to Jacob's Well in 1905 from another historic inn, The Wheatsheaf, in Davygate – and before that from another pub in the Micklegate area. 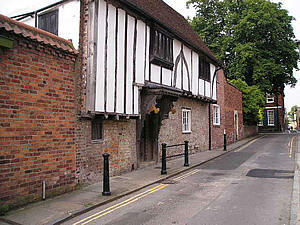 The Butchers' Gild was fortunate to find this newly restored property available as a new home for courts and receptions when it moved out of its hall in The Shambles. The Company's chairs, tables, prints and clock furnished Jacob's Well in an appropriate fashion and the Gild is pleased to be able to support Holy Trinity in keeping this as a working building for functions, adult education courses, parish meetings and business lunches.